Now, I first heard about this conference from friends and colleagues who forwarded the Call for Papers to me. From my attempts at an elevator pitch they had all gathered a vague sense that I work on travel writing and literary geography. And when I first saw the theme of the conference I figured I was a shoe-in. I work on stories first written in the late nineteenth-century. They have an author. Clearly this conference was made for me. But the more I thought about it, the more I realised that the twin themes of this conference, authors and their places, is exactly what is missing from the literary travel writing I am studying. So, today I want to talk to you about a type of literary tourism that is, in fact, the opposite of much that you have already heard about. For fans of Sherlock Holmes, to travel in his world is not, as I will demonstrate, to visit the hallowed ground on which his author worked. Yet nor is it to walk, step-by-step, the highways and byways of his story world. Rather, to tour the world of Sherlock Holmes is to walk in a landscape that combines fiction and reality, history and the present. I will make this case by examining the work of one man, David Hammer. He was perhaps the first true Sherlockian travel writer; he was certainly one of the first to articulate this image of the world of Sherlock Holmes, sitting both within and without the ‘real’ world. I will explore one of his books, called A Dangerous Game: Being a Travel Guide to the Europe of Sherlock Holmes. He wrote others about Britain and America, too. I have chosen this one because it appears to follow more closely than the others the events of Doyle’s stories and one of the famous places he visited, in Switzerland; yet in doing so it actually strays further into the world of Sherlock Holmes as fans have made it. Hammer’s travel writing is embedded in a tradition of fan writing known as Sherlockiana, produced by fans of Sherlock Holmes who call themselves Sherlockians. This peculiar fandom is characterised by a practice known as ‘playing the game’: that is the ironic or ludic belief that Sherlock Holmes is not a literary character but was rather a historical figure living at the end of the Victorian period. Hammer recognises how odd this might seem to the uninitiated, writing at the beginning of A Dangerous Game, “[a]dmittedly, the deliberative confusion of reality with fancy is a supreme idiocy”. Yet he goes ahead and does it all the same. 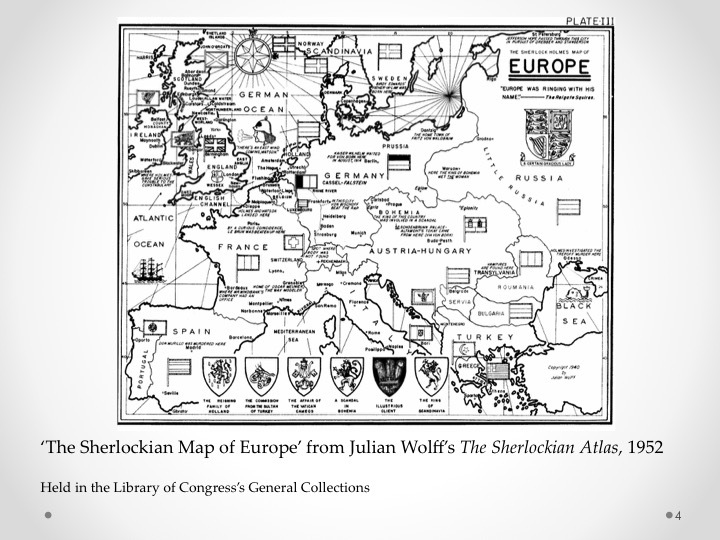 By the time Hammer was writing his guide to the Europe of Sherlock Holmes, in the early 1990s, Sherlockians had been playing the game, primarily in Britain and America but also in many other parts of the world, for more than fifty years. All across America, for instance, fan societies with names such as The Hugo’s Companions, The Reigate Squires, or The Midlothian Mendicants produced quarterly periodicals or newsletters with names like The Grimpen Mire Gazette, The Devonshire County Chronicle, and The Racing Form, that were circulated locally, nationally and internationally to subscribers. 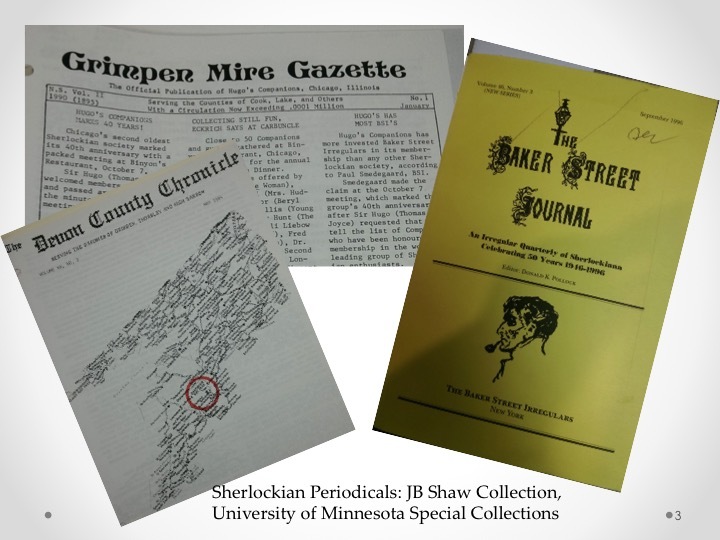 We should not forget, of course, the Baker Street Irregulars, the most senior Sherlockian society in America of which all these other societies registered as ‘scions’ or offshoots, and its own quarterly Baker Street Journal. These periodicals featured scholarly articles that often discussed aspects of Arthur Conan Doyle’s stories (known to fans as ‘The Canon’), new pieces of fan fiction, games, and puzzles, and letters pages in which lively debates about aspects of Holmes and Watson’s lives and times raged. As a senior member of the Baker Street Irregulars and an irregular contributor to the Baker Street Journal, Hammer’s books owe much to the practice of Sherlockiana. Within this general tradition of blurring the lines of fantasy and reality, Hammer’s books also draw on a Sherlockian history of exploring the world through the Sherlock Holmes stories. In his autobiographical The Game is Underfoot!, Hammer explains how the first draft of his first travel book, a guide to Sherlock Holmes sites in England, was closer to a gazetteer than a travel book or guidebook. As he wrote, “My theory was that none want to hear about the teller of the tale, or how the place was located. I thought that to relate details about the journey was arrogance; only the arrival was significant”. By writing in this style, Hammer drew on the earlier work of Edgar W. Smith, famous in Sherlockian circles as head of the Baker Street Irregulars and for creating Baker Street and Beyond, arguably the first Sherlockian gazetteer. Smith’s book listed in alphabetical order all those place names featured in the Canon, accompanied by a short explanation of their significance in the stories and by five maps which located these sites alongside selected real-world counterparts. Although he drew on this Sherlockian tradition of interest in story places, as I will show, Hammer moved beyond Canonical locations to create a new type of Sherlockian literary tourism. So how does Hammer play the game in his travel books? He does so in a particular way: by building a Sherlockian image of the Victorian world that is rooted both in historical fact and the ‘atmosphere’ of the Sherlock Holmes stories and projecting that image onto the Europe through which he moves. A key part of this blended factual and fictional Europe is Hammer’s conscious displacement of Doyle; by writing him into the world of Sherlock Holmes as ‘the literary agent’, a character of particular transience. Unlike earlier explorers of Sherlockian geography, Hammer was not content to sit at home and pour over atlases. He went out into the world to see the sites for himself. As he wrote at the beginning of A Dangerous Game, “for the site-maven… the research must be confirmed or negated by physical inspection. There must be both search and research”. 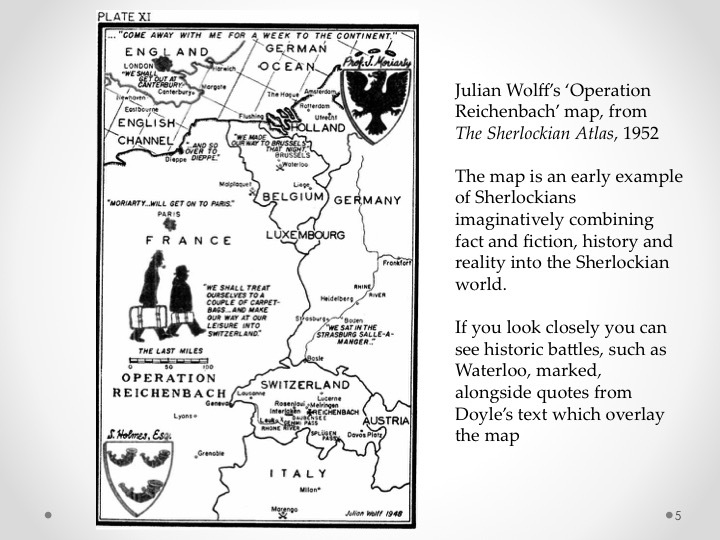 Hammer’s particular style of ‘playing the game’ in his travel books can be described as exploring the ‘rough edges’ of Doyle’s story world. I borrow the term from David Brewer’s study of characters and the readers who become invested in them. These readers will engage in a kind of feedback loop to explain inconsistencies and inaccuracies in characters like Sherlock Holmes. Often they are details of a story left unsaid. For invested fans, these rough edges are in need of exploring, for how can a record of a character be true and reliable if it is incomplete? But they are also the explanation for a character’s putative reality: just as real lives cannot be reduced in their complexity to fictional stories, so the beloved character must also have a life that is bigger than the text we have to hand. 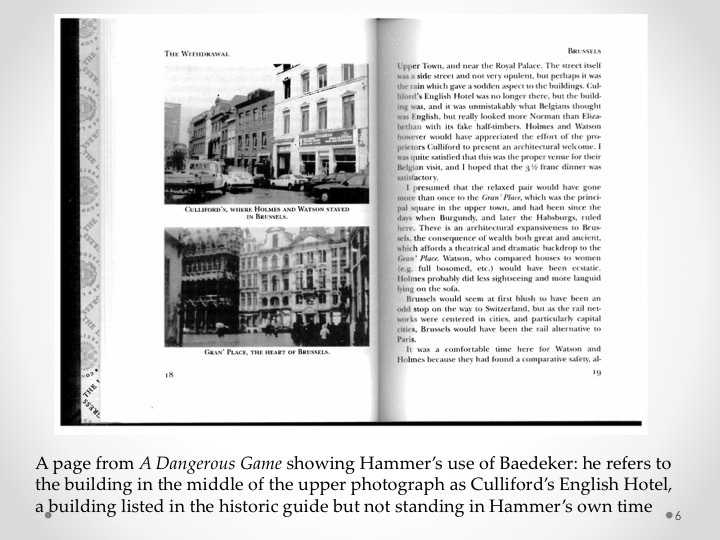 Indispensable to his ludic recreation of the travels of Holmes and Watson, and the exploration of their rough edges, is Hammer’s reliance on contemporary, 1890s copies of Baedeker’s guidebooks. Although he is not specific about which ones, it is likely that he used guides to Belgium and Holland, Paris and its Environs, which included routes from London and to Germany, and Switzerland. These artifacts are among the many material items and supposed inclinations that Hammer wraps around Holmes to bring him to life. Yet, unlike the others, from the trains Holmes may have taken to the hotels in which he and Watson might have stayed, Baedeker’s guides exist both in and out of the fictional world of Sherlock Holmes. They act as a linchpin holding together the fictional and factual elements of Hammer’s Sherlockian Europe. The reasons for this are twofold. Firstly, as Hammer notes, “Most English travellers took with them the English edition of Baedeker”: it is highly likely, he implies, that Holmes would have been included in this group. So Hammer can use his guides as tools to think like Holmes, when scouting out unrecorded Holmesian locations. Secondly, as Hammer writes near the beginning of his book, “The flavour of the place and the time can still be extracted… the ambiance is as important as the analysis”. Baedeker’s guides, with their historical information, their prices in pounds, shillings, and pence and the clues they provide to the travelling habits of late-Victorian bourgeoisie, are a suitable basis for Hammer to extract the flavour of the place and time of Sherlockian Europe. “We can also derive some significant data as to what the travellers did from what were the expressed interests of Holmes. We know that he would have visited the celebrated cathedral, started around the year 1000 AD and constructed of red sandstone from the nearby Vosges mountains. He probably climbed to the top of the single tower, some 142 meters high, for it was this tower that the young student Goethe climbed in an unsuccessful but brave effort to cure his vertigo… Holmes would certainly not have missed the sentimental climb. We can also deduce something further. Across from the side of the cathedral is the Palais Rohan… The Palais, even in Holmes’s day, was a museum and part of it contains considerable treasures of art, including an oil seascape by Claude-Jules Vernet, to whom Holmes was related through a grandmother. Baedeker confirms that the picture was there in the 1890s and Holmes most surely would not have missed it”. 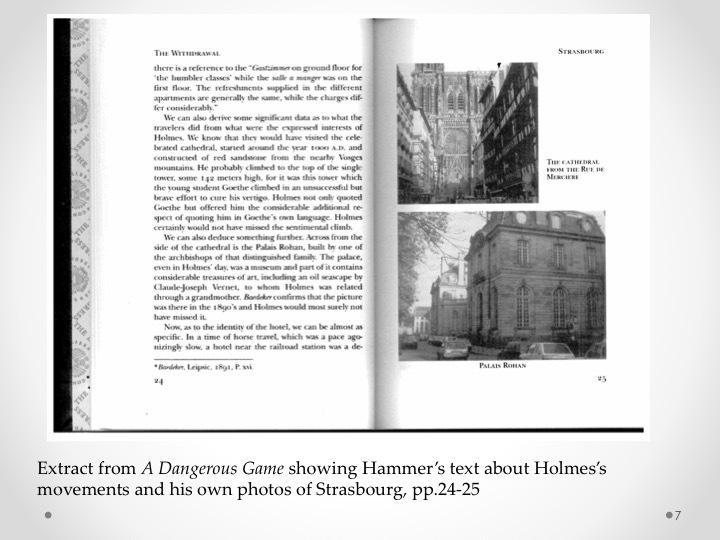 In this particularly rich passage, Hammer combines information from his modern guidebook about the history of the two buildings with Sherlockian details about Holmes’s ancestry, Canonical details about Holmes’s love of Goethe and information from Baedeker about what was happening in Strasbourg in the 1890s. Hammer’s image of the world of Sherlock Holmes as a blend of the factual and fictional, the historical and the contemporary, leaves little room for Holmes’s creator. In fact, in Hammer’s travel writing Doyle is recast as the spectral figure of ‘the literary agent’ and set to wandering across the landscape, popping up from time to time in places of transience like hotels, streets and railway stations. As Hammer wrote in The Game is Underfoot!, the idea that got him thinking about writing a Sherlockian travel book was the image of Doyle walking the country lanes around his home in Norwood, in South London. He reasoned that this mobility provided Doyle with ideas for stories and story locations. Hammer maintains this image of the ever-mobile Doyle throughout his travel writing. In Hammer’s earlier The London of Sherlock Holmes, the literary agent can be found strolling the country lanes around his home in Norwood; when he appears in central London it is to pay a visit to the Metropole Hotel on Northumberland Avenue. This visit provides Hammer with evidence to claim that the Hotel Cosmopolitan, from which the eponymous gem was stolen in ‘The Blue Carbuncle’ was actually the Metropole. The comparative stability of Hammer’s Holmesian locations, fixed in time and space through his identification, and the apparent fluidity of his mobile literary agent, who is never fixed to one place, works to make Holmes a more solid, more real figure in the readers’ minds. 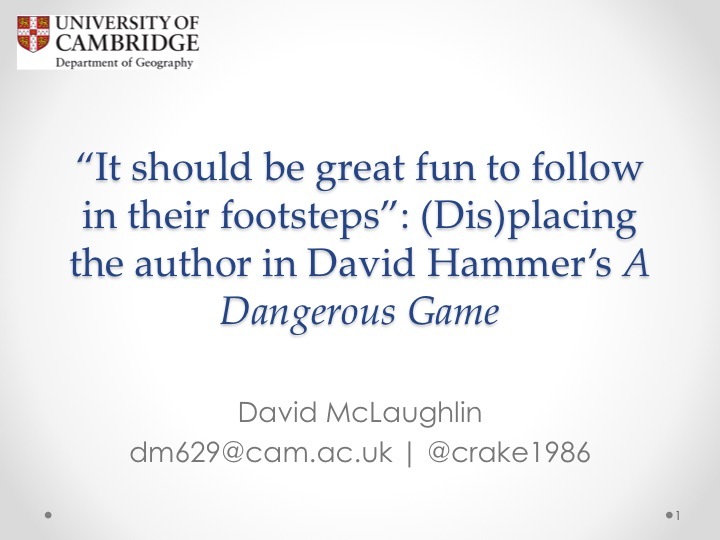 In A Dangerous Game, Doyle only haunts Hammer’s text. Writing of the hotel where Holmes and Watson stayed, in the town of Meiringen, Hammer says that, “Some years ago I concluded that the Englisher Hof was the du Sauvage, largely on the basis of the English Chapel, and I believe that this attribution has been generally accepted”. What Hammer does not mention, although he must surely have known, is that biographers of Doyle agree that he got the idea to kill off Holmes at the Reichenbach falls after visiting Switzerland with his first wife Touie in 1893, and staying at the Hotel du Sauvage. A new form of literary tourism? So here, perhaps, it is worth offering some preliminary thoughts on the ways in which Hammer’s books fit within other forms of literary tourism about Sherlock Holmes. I have tried, through a discussion of the historical role of ‘playing the game’, to explain why fans of the Sherlock Holmes stories have more often sidestepped sites associated with Doyle in favour of walking in the steps of his famous character. Yet, I believe that Hammer’s literary travel writing differs from other Sherlockian examples too. Although Hammer proclaims that, “it should be great fun to follow in their footsteps”, his travel writing goes beyond being an example of “metempsychosis” or an attempt to inhabit, for a time, the actions and story of a fictional character. Rather, he imagines Holmes and Watson as real, historical people moving through a literary landscape that is a blend of the factual and the fictional. In particular, I would suggest, we can highlight two key aspects of Hammer’s travel writing. 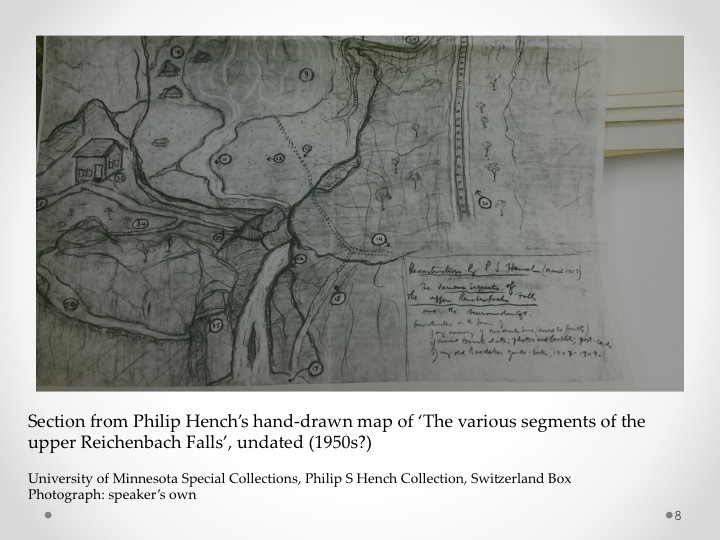 First, by reading the landscapes in which he travels through a lens that combines historical and fictional information, Hammer claims to be discovering an intangible heritage. He admits in The Games is Underfoot! that, “I never really believed that Holmes had lived. I still don’t, but I do believe that he was real; so real, in fact, that if he has not become a figure of history, he has of heritage, which surely constitutes a significant form of reality. Besides, as I once wrote in the same context, there is meaning in myth and fact in fiction.” Hammer’s travel writing is an attempt to locate that meaning in myth and to make a record of that heritage for the wider Sherlockian community. 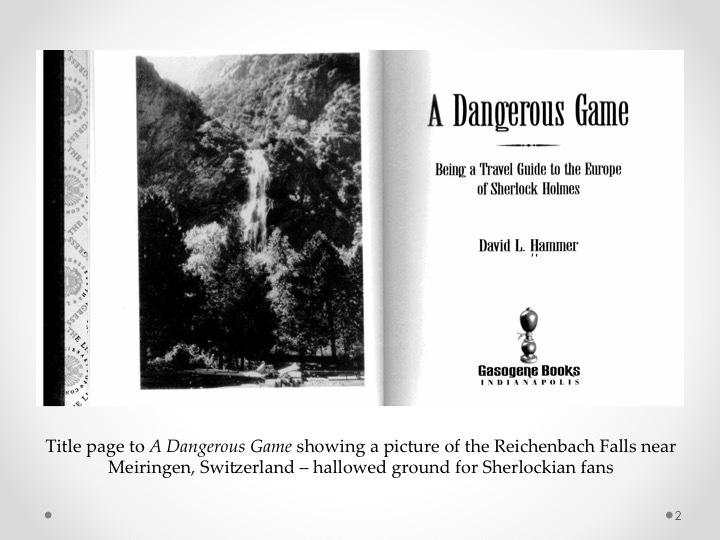 As books, A Dangerous Game and the other titles in his Game series likely acted as sites for the imaginary transport of Sherlockian fans in America to the European sites at which this heritage played out. Hammer clearly subscribes to this idea of imaginative mobility of travels in the world of Sherlock Holmes when he writes, in A Dangerous Game, that Sherlockians, “are essentially time-travellers, committed to another time, and perhaps worse, to places where we never lived, and for some, have never seen”. Yet, as we have seen, it is not enough for Hammer to rely from afar on secondary materials. His main tool for measuring the length and breadth of the world of Sherlock Holmes is himself and his own, first-hand experience of its locations. For Hammer, Sherlockians are not just the inheritors of the intangible heritage of the world of Sherlock Holmes: they are the means by which it remains alive. This sentiment is comparable to the idea more widely held in Sherlockian fan circles that ‘the master’ will never die so long as fans keep him alive through writing about him, talking about him and celebrating him. Through Hammer’s travel writing we can observe the idea that to keep the world of Sherlock Holmes alive, one must walk through it. Secondly, through his books, Hammer helps to co-produces the character of Holmes and the world in which he moves; adding to the creative efforts of Doyle and of the Sherlockian tradition. He attempts, for instance, to locate sites of Sherlockian significance at the rough edges of Doyle’s stories and to give them meaning within Sherlockians’ world-view. So, rather than Hammer walking in Holmes’s footsteps, we could say that Holmes begins to walk in Hammer’s footsteps; with each step forward Hammer widens and deepens the reach of Sherlock Holmes in Europe, well beyond that imagined by Doyle. Hammer’s Sherlockian literary tourism shows us that for some readers, it is not enough to take an existing literary landscape as it comes. 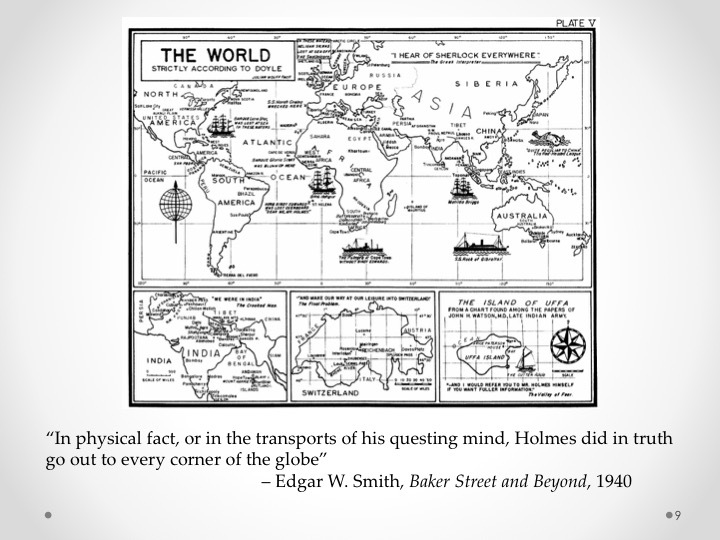 As Edgar W. Smith once wrote, “In physical fact, or in the transports of his questing mind, Holmes did in truth go out to every corner of the globe”. At least, with literary tourists like Hammer on the case, this statement becomes truer every day. 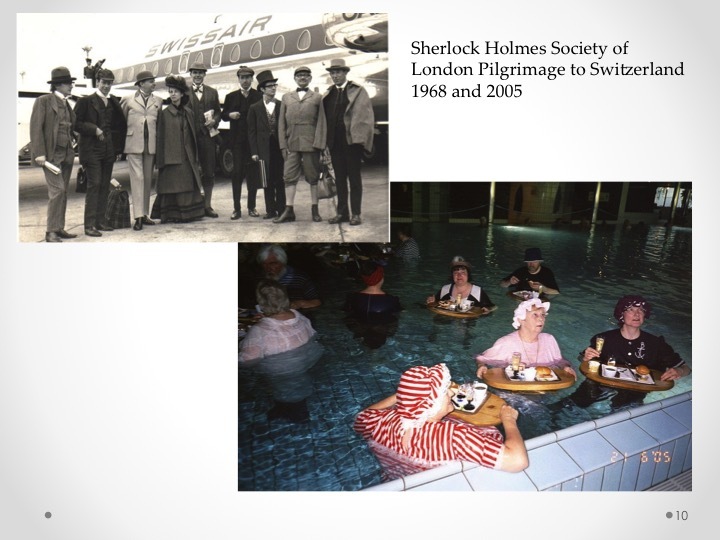 I will end here by providing a brief look at those Sherlockians who have taken the journey to Switzerland, agreeing with Hammer that it is, indeed, great fun to follow in their footsteps.